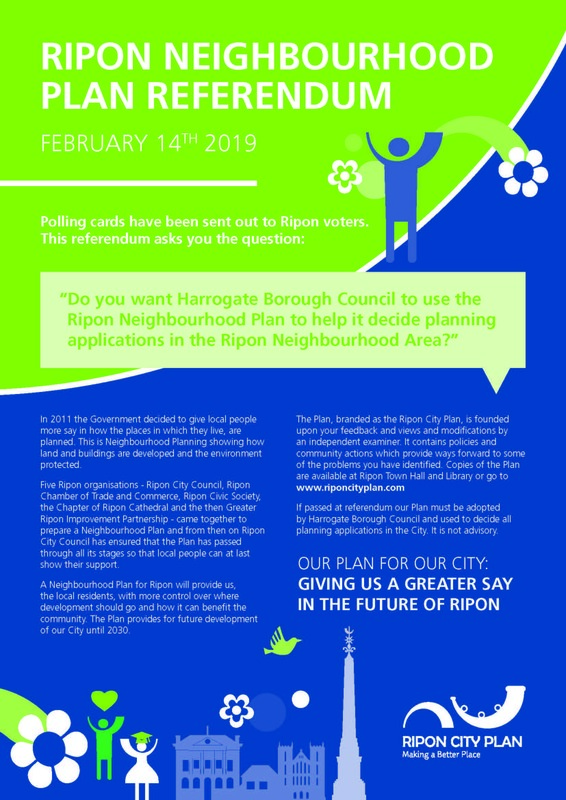 Please find below the Notice of Referendum on the Neighbourhood Plan for Ripon. 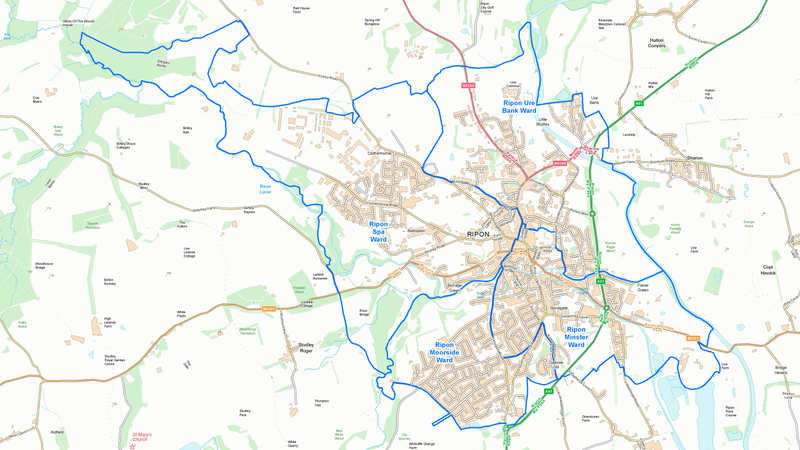 The referendum area and the area covered by the neighbourhood plan is the parish area of Ripon (see Map 1). A persons qualifying address is, in relation to a person registered in the register of electors, the address in respect of which he or she is entitled to be registered. which the limit has been calculated is 11,696.
to those used at local government elections. NYCC have confirmed that they will continue the current service beyond the initial period until another solution is found. Ripon City Council hopes to be able to provide an enhanced service in 2019. At the meeting of Full Council on 10th December 2018 Ripon City Council resolved to disband the Discover Ripon office. The size of events that the Council arrange has grown considerably and the complexities of arranging those events, together with the changing event management climate means that the Council has resolved to outsource event management to a suitable specialist firm. The Council also resolved to outsource the promotional and marketing activities that have previously been carried out by the Discover Ripon office. Since being made aware that Harrogate Coach Travel were withdrawing their commercial, Ripon City Bus Services RS1, RS2, RS3 from 24th November 2018 the Council has been working towards a solution to replace the service. We have investigated options to replace the services and sought the help of North Yorkshire County Council who undertook a procurement process on our behalf to gauge the costs of retaining the service. The City Council met on Monday 19th November to discuss these costs, however it was agreed that the City Council were not in a position to meet the cost of the quotations that were received. In an effort to keep the service running North Yorkshire County Council have agreed to continue the services for an interim period using its own fleet services minibus, whilst a longer term, cost effective solution can be investigated. The new service will start from Monday 26th November and operate Monday to Friday, the service will operate the existing route, but there is an amended timetable, details are available below. Ripon City Council is pleased to report that we will shortly be inviting tenders for various options for a city wide bus provision through North Yorkshire County Council’s tender portal. We anticipate that the new service will commence during the first week of December. NYCC has offered to bridge the gap between the current service ending and the new one starting by using one of their fleet vehicles to provide a slightly reduced service. At the meeting of Full Council on 8th October 2018 Ripon City Council resolved to exclude press and public to receive an update from the Charity Commissioner on Ripon Community Link. The release of the document under this item included reference to Section 54-59 of the Charities Act 2011 which specifies that the disclosure has been made to Ripon City Council as a public authority. The disclosure is made solely for the purposes of enabling or assisting RCC in the discharge of its function and is provided on condition that it the information will only be used by the addressee. All papers distributed were returned to the Clerk at the end of the item. The update was received by Council with thanks. Ripon City Council would like to publicly confirm that it considers Ripon Community Link an important and integral part of the community in the City of Ripon. The Council looks forward to re-establishing close working relationships with the charity and will arrange to meet with them at an early date. The Council intends to explore potential funding to the Charity through the Council’s own Strategic Investment Fund in the coming months. Ripon City Council resolved in principle to make a Partnership Delivery Fund Grant available to allow for the provision of a bus service within the City at yesterday evening’s meeting of Full Council. Council representatives are due to meet with North Yorkshire County Council within the coming days to explore the options available for the route currently serviced by Connexions. The awarding of the grant is subject to the outcome of our discussions with NYCC. It has been necessary to close the playground at Quarry Moor pending maintenance/repairs. We will update progress as soon as we can. In July 2017 Ripon City Council appointed a contractor to carry out a conservation restoration on the Cabmen’s Shelter and started the process of obtaining listed building consent to carry out the works. Despite the efforts of our specialist contractor and the Council staff we have still not been able to obtain the necessary permissions. One of the biggest stumbling blocks has been the fact that Historic England would like to see the shelter restored in-situ. Restoration in situ is not possible for a number of reasons, one of them being that the cost of renovation would increase by 100%. 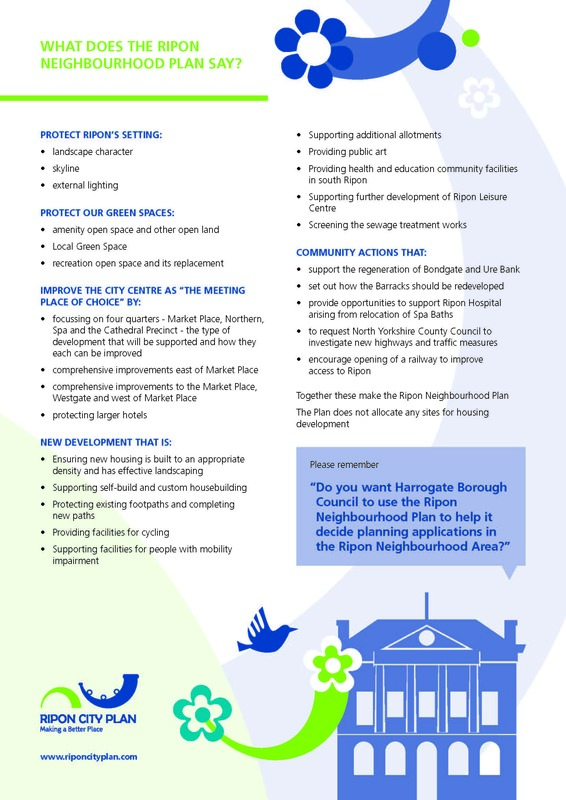 Ripon City Council has enlisted the help of Ripon Civic Society and we hope that we will be able to make progress on obtaining permissions soonest. Ripon City Council recently employed an Events Officer, Lorna Snowden. Lorna will help to organise the Council’s events in Ripon. Lorna will work closely with the ‘Events Working Group’ made up of Councillors Craggs, Hardisty, Martin and Parkin. Lorna will also assist the Clerk’s office on civic events. Existing Ripon City Council organised events include Christmas Lights Switch on, Christmas Market on the Market Square, New Years Eve, Sights and Sounds on the Market Square. The Council hope to arrange more events on the Market Square in 2019. Lorna is based at Hugh Ripley Hall. We have received a number of enquiries about the Cabmen’s Shelter in recent weeks. Following a tender process the Finance and General Purposes Committee of the Council resolved to appoint a specialised conservation company to restore the shelter in the summer of 2017. Ripon City Council made a Listed Building works application to the Heritage Team at HBC in late summer. Our chosen contractor is now working with HBC to agree proposed scope of works to allow the restoration to proceed. The chosen contractor has a track record in restoring heritage wooden railway carriages. We hope that works are approved by the HBC Heritage Team in the not too distant future.